With daylight hours still short as ever, my thoughts have been drifting frequently to the sunshine-soaked holidays of last year. Vibrant Miami, tranquil Maldives and the one that left the biggest impression of all – our virgin visit to New England, or more specifically the seaside idylls of Martha’s Vineyard and Cape Cod. We flew into Boston, stayed a couple of days (lovely city but we weren’t blown away by what we ate there), then jumped in a rental for the two hour journey to our one night digs in the Cape, stopping to refuel at the awesome Lobster Trap in Bourne along the way. What a feast it was. Clam Chowder chockfull of shellfish, crispy fried Whole Belly Clams and of course the Lobster for which they are known, steamed, and served with corn on the cob, potato salad and clarified butter. 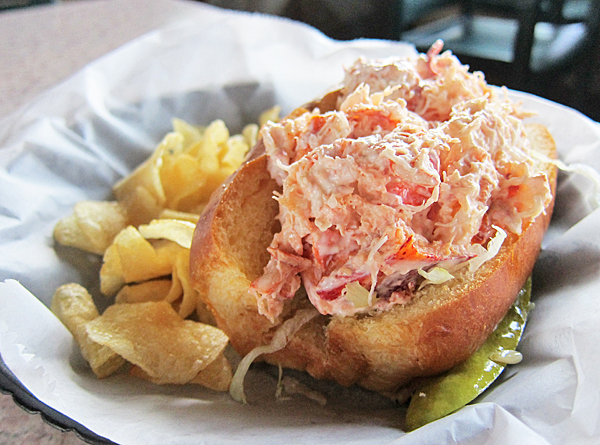 It was so good I returned for a Lobster Roll the next day after lunch at J.T’s Seafood. Warm toasted buttery brioche loaded with sweet freshly-picked lobster meat lightly dressed in mayo – delicious, and far better than the disappointing one we had at our aforementioned lunch venue. 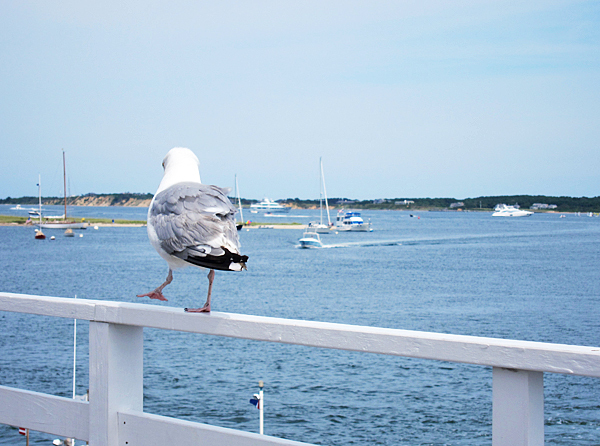 A ferry ride away in Martha’s Vineyard we got stuck into more lobster at Atria. 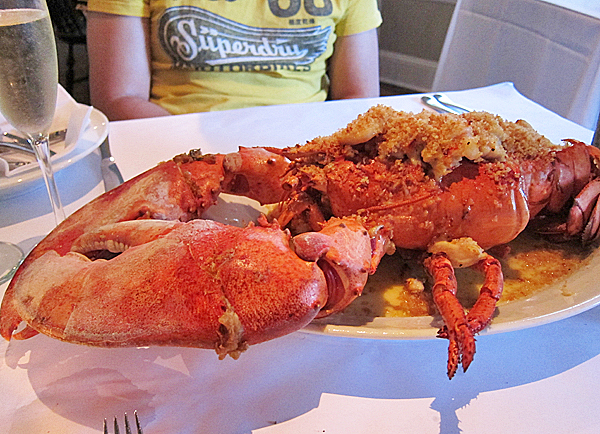 A 4 lb (2 kg) monster stuffed with scallops, crab, prawns and MORE lobster and baked with a parmesan breadcrumb topping. From its weight our dinner was roughly 15 years old, so we didn’t expect the flesh to be as sweet and succulent as it was. Definitely some of the best lobster we had ever eaten, and a steal at $100. 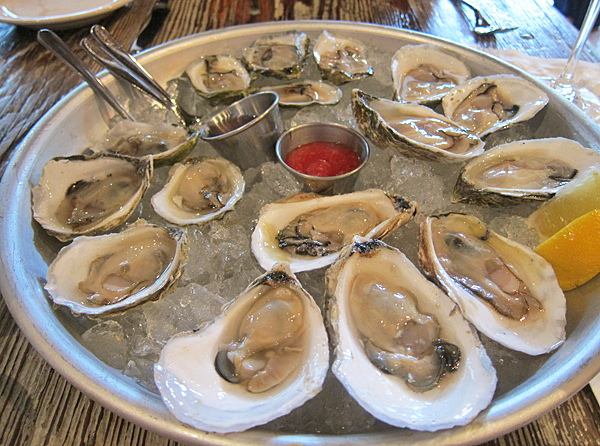 At the The Port Hunter we had an enjoyable casual meal of mussels, yellowfin tuna egg rolls, (yet another) lobster roll and a nice selection of local oysters. Quaint little clam shack The Bite was a fried seafood haven, and just a short stroll from the pretty Menemsha coastline. After a short wait (everything is fried to order) we grabbed our brown takeout bags and got stuck in at the nearby beachside tables. 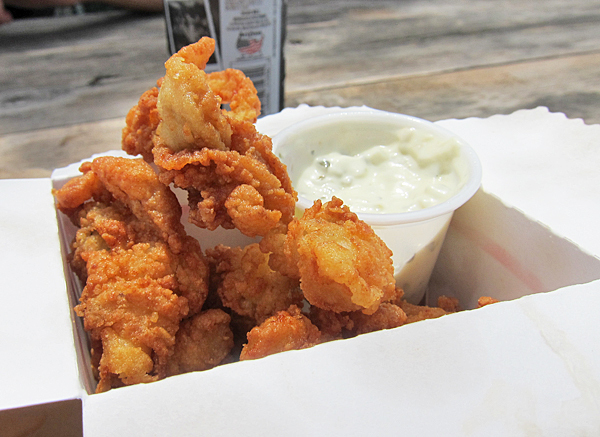 The fried clams served with a small obligatory pot of tartare sauce were spot on – plump meaty morsels enrobed in a light golden batter. 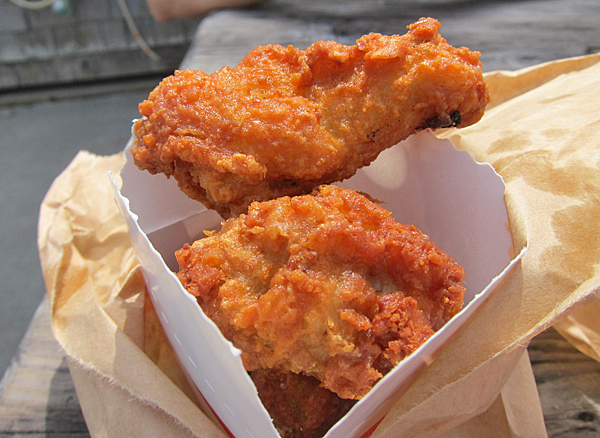 Surprisingly our favourite deep-fried treat weren’t of the shellfish variety at all, but the chicken wings which were moist, juicy and coated in the same well-seasoned batter. 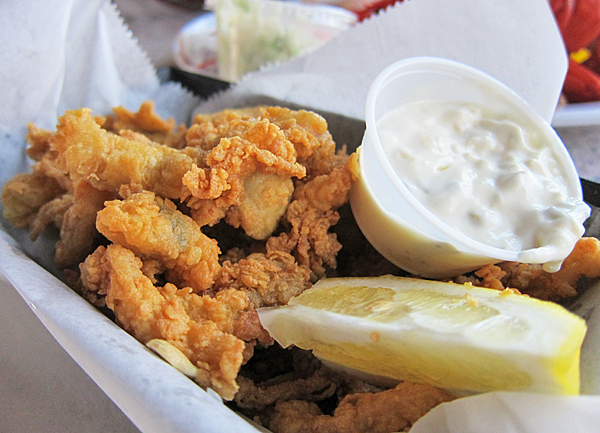 It wasn’t all seafood on the trip. 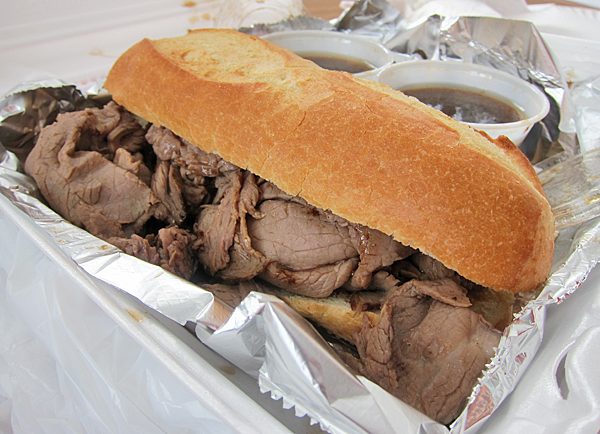 We fell in love with the super-sized sandwiches at Skinny’s Fat Sandwiches – their delicious marinara-slathered Chicken Parm and French Dip brimful of sliced roast beef served with two pots of gravy, were both incredible. But it was the cheesy meat-packed Cuban (roasted pork loin, virginia ham, swiss cheese, pickles and chipotle mayo in a toasted french roll) that totally stole the show. YUM. ~ by gourmettraveller on January 11, 2013. Your pictures are AMAZING! What are you shooting with? Thanks Winnie! I use a Canon S95. It’s great even in dim lighting and small enough to throw in the handbag. I hv the same camera but your pictures are truely AMAZING! What a great pleasure to look at them!!! I love your post!!! I shouldn’t have read this at this time of night. Need both sunshine and FOOD!! 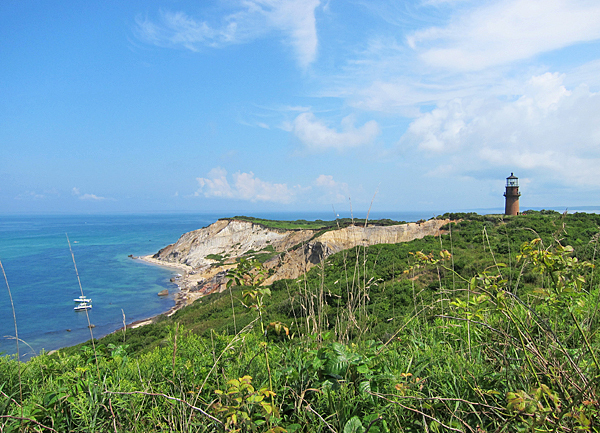 I spent 6 days on Martha’s Vineyard in Sept 2011. Of all the places I visited in my first visit to USA this was my favourite. I was lucky enough to be travelling with a dear friend who has spent a lot of time on MV. 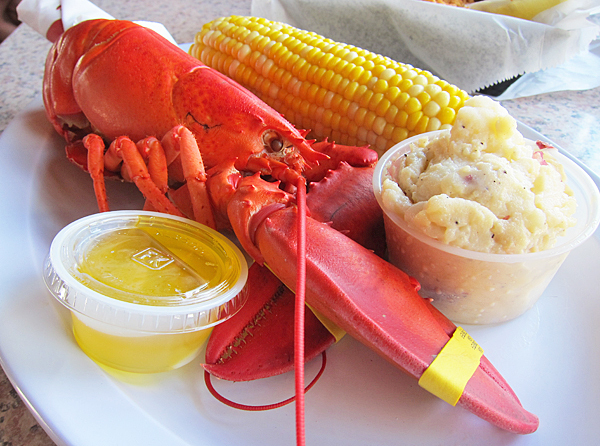 We had fresh lobsters, cooked at home, the first night with corn and tons of melted butter. I thought I’d landed in heaven. Next night it was amazing scallops.. I never seen scallops that size! Another night we bought some delicious fresh Halibut which my friend cooked perfectly. 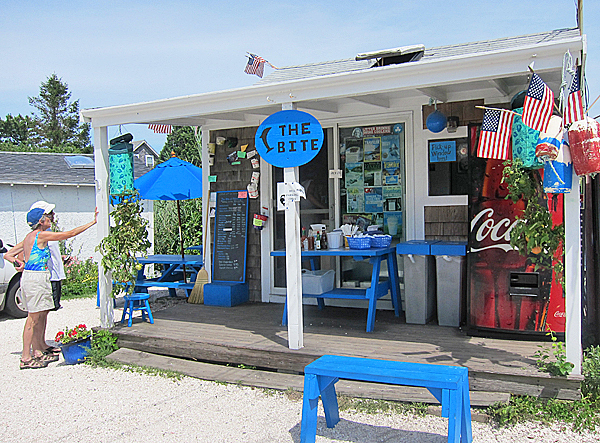 The best lobster roll I had was in Edgartown, but I dont remember the name of the cafe. I also ate at The Bite, not sure what I had though. There was a place called Al’s or Allen’s ? where my friend got some chilli in a tub, sadly I was concerned about the level of “heat” and didnt order this… once I tested hers I was kicking myself… we went back another day but they had sold out.. 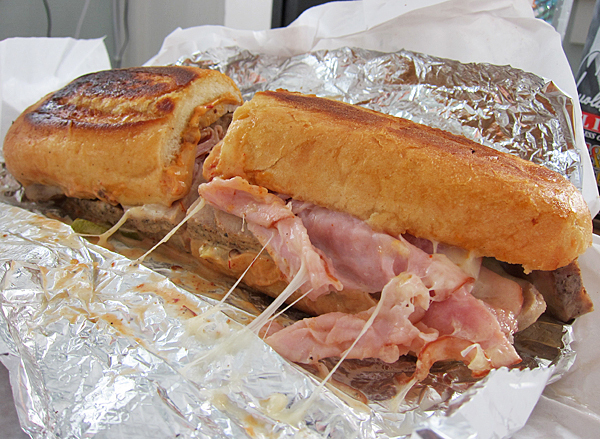 I found this blog because I googled ” Cuban Sandwich”.